The article below reports the benefits of wearing makeup and the impact on how others perceive you misses the big picture entirely. It’s not makeup alone tha that has this effect. The photos shown in the article are of women who have youthful features which the artful application of makeup enhanced. The key elements to looking competent and trustworthy overlap with the elements of being attractive (what we see biologically as “strong”). Each of the faces shown have nice eyes, cheek bones and well defined youthful jawline. Artistically applied makeup accentuates these features making them look even better. The key is that good foundation (facial structure) can be enhanced with makeup. In my practice, I’ve observed that as many people experience aging changes, they compensate by trying to cover the puffy bags under the eyes and the area of the cheek and jowls with makeup which makes these areas look worse. Just like fine clothes look great on a fit and healthy body, beautifully applied makeup looks great on a balanced face. 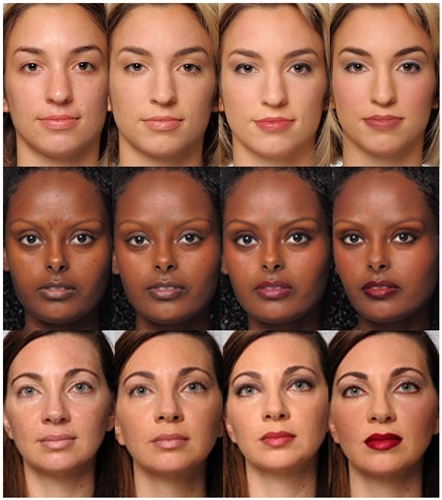 Models without makeup and with natural, professional and glamorous makeup, as shown in a recent study. In beauty, less is often more. It turns out a little makeup goes a long way in how the public perceives you, but piling on the products does you no favors. Researchers found that makeup makes women more attractive, competent and trustworthy as opposed to their bare-faced peers, according to a new study, funded by cosmetics giant Procter & Gamble and carried out by scientists at Massachusetts General Hospital, Harvard Medical School, Boston University and the Dana-Farber Cancer Institute. The study’s participants were given just 250 milliseconds to look at several photos of women in various degrees of makeup – no makeup, “natural”, “professional”, and “glamorous” – with the ratings increasing with the amount of beauty product used. “We found that when faces were shown very quickly, all ratings went up with cosmetics in all different looks,” lead author Nancy Etcoff, associate researcher at Massachusetts General Hospital, told ABC News. But before you get carried away at vanity table, there’s a limit: Positive perception declines as makeup gets heavier. When those same participants were given time to study the images for a lengthier amount of time, the ratings changed. Instead, for the dramatic makeup looks, “people saw them as equally likable and much more attractive and competent, but less trustworthy,” Etcoff told ABC. Is the “Housewives” look less desirable? “Too much makeup can appear as a shield, something you’re trying to either hide behind, or use to change who you are,” TODAY style editor Bobbie Thomas said.